The elegant fin de siècle villas that line Vassilissis Olgas Avenue are a unique part of the architectural heritage of Thessaloniki. These villas were once the homes of wealthy merchant families, with a variety of religious and cultural backgrounds, including Greeks, Italians and Turks, Christians, Jews and Muslims. Many of the villas have been lost in recent decades, but those that survive narrate the story of how this was once a cosmopolitan and multicultural city. Some of have been restored and serve as public buildings, schools or private residence, others are decaying and are in danger of being lost. 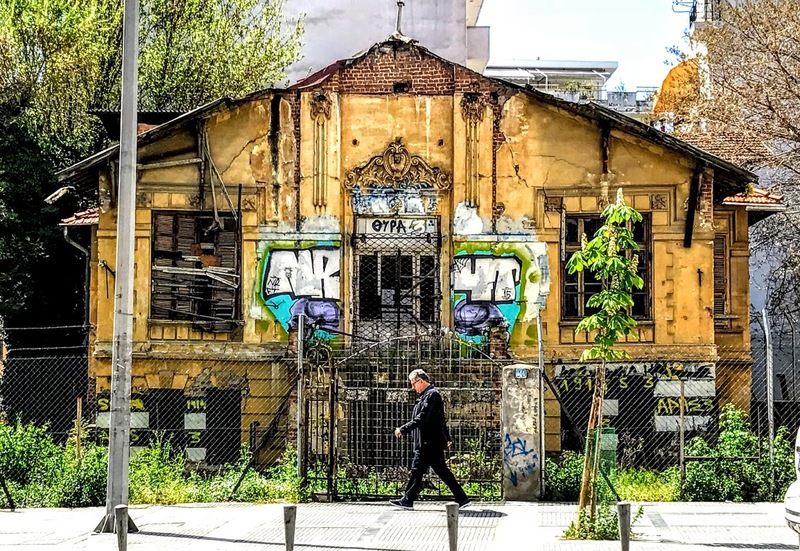 One of the saddest sights among the surviving villas is the Villa Hirsch on the corner of 144 Vassilissis Olgas and Gravias Street, the mansion of Vitali Fernandez is in a decaying condition. According to the metallic wind-vane on the roof of the house, this villa was designed in 1911 by the Italian architect Pierro Arrigoni (1856-1940). Pierro Arrigoni (Πιέρο Αριγκόνι) was born in Turin in 1856. He worked in Thessaloniki in the late 19th and early 20th century, and he significantly shaped the city. His architectural style was historic at first, but he was known for his eclectic villas in the art déco style. His masterpiece, of course, is the eclectic Villa Dino Fernandez or Casa Bianca (1910-1912), in which he combined different architectural styles. His other great works in Thessaloniki include the Villa Ahmet Kapanci (1890), the Villa Mehmet Kapanci (1893), the Limodon Hospital, formerly the Regina Margherita Italian Hospital (1894), the Railway Museum, a former military station (1894), the Electricity Plant (1899), and the Ippokratio Hospital, formerly the Hirsch Hospital (1902). Arrigoni’s Casa Bianca, which is one of the city’s most renowned mansions, was owned by Dino Fernandez Diaz, a Jewish entrepreneur of Spanish heritage. His daughter Alini became entangled in a controversial romance with Spyros Alibertis, a captain in the 7th battalion in the Greek Army. Their relationship shocked conservative society in Thessaloniki. Numerous articles and reports in the press referred to this relationship as a social scandal because Alini was Jewish and Spyros was a Christian, and any marriage was dependent on the baptism of Aline, something her family could not accept. Against all odds, and despite hostile social attitudes, they secretly fled to Athens and got married in 1914. They later returned to Thessaloniki when the social turmoil they had stirred up had calmed down. When the Germans invaded Greece, they took control of the Casa Bianca. Dino Fernandez and members of his family, like many other Jewish families tried to escape in Italy. But they were captured by the SS near the village of Meira, by Lake Maggiore, and were executed. But Spyros and Aline survived the Holocaust, and after World War II they continued to live in the Villa Bianca until 1965. They died shortly after one another. Another family member, Vitali Fernandez, commissioned the Villa Hirsch on the same street. The house was named in honour of the Austrian-Jewish philanthropist Maurice de Hirsch, who lived in Thessaloniki and who developed the Balkan region’s railways. After World War II, the Villa Hirsch housed the First Police Station for many decades, and it is still known to local people by this name. The watch-box with its crenellations dates from the Greek Civil War. Today, the Villa Hirsch remains the property of the heirs of Vitali Fernandez’s Alini, who lived in Paris after World War II. But because the villa has been abandoned for so long, it is now dilapidated and tumbling down. Although some of its stucco plaster decorations of heads and flowers can still be seen above the windows of the second floor, the Villa Hirsch is quickly falling into ruins and has lost most of its architectural and ornamental elements. The architect of the Villa Bianca and the Villa Hirsch, Pierro Arrigoni, was murdered in Thessaloniki in 1940. But his work remains an important part of the architectural legacy of the city, which makes remedial work on the Villa Hirsch work and its restoration even more compelling.